Also the 112th Mystery Bridge. A while back I received a phone call from a local living in Zwickau (Saxony) via the Free Press, who, in response to a newspaper article about my bridgehunting exploits there and in Glauchau, wanted me to check out a cool bridge that was not on the tour guide on Zwickau’s bridges. It was around 200 years old and was located in the suburb of Oberplanitz, which is in the southwestern part of the city. This came shortly before I got sick with the flu that was making its rounds in the region, including the school where I teach English. I had to sit it out for a couple weeks before I could get better. As soon as I was fully healthy and “physically able to perform,” I decided to embark on a small trip to get there. The day couldn’t have been much prettier. Sunny skies accompanied with a Super Full Moon in the evening made for a trip that was well worth it. Enter the local living in Zwickau who is a “historian” having lived in the area for decades, Dieter Hofmann, whom I met at his place and who led me to the “Steinbruch” region on the northern end of Oberplanitz. We use the German word “Steinbruch” to describe the word quarry. According to Hofmann the region where the stone arch bridge is located had at least six different quarries, where different types of minerals were dug up and transported to regions for use on different forms of architecture. Red rock came from the region and was used for the construction of the Göltzschtal Viaduct in the Vogtland region in western Saxony. That bridge, built in 1851 and carries the Nuremberg-Hof-Dresden Magistrate Rail Line, still holds the title of being the largest brick arch viaduct in the world with four stories of arches spanning the River Göltzsch between Reichenbach and Greiz (Thuringia). After touring the quarries, all of which have been discontinued since the Reunification of Germany, we came to the jewel in the forest- a stone arch bridge spanning small creek on the outer edge of Kreuzberg Forest. According to Google Maps, the bridge used to carry Eisensteinstrasse but, according to sources, has been closed to traffic for at least 30 years. According to Hofmann and another local whom we met along the way with his dog, the road which the bridge carried was a primary route for transporting the likes of iron ore, granite, quartzite, limestone and other minerals out of the quarries and to their destinations for processing and use. That was until the route was cut short with a present-day bypass connecting Werdau and Schneeberg and dissecting the western side of Zwickau. The bridge itself is definitely an old, but primitive structure. It consists of a one-span stone arch span spanning the Planitzbach, a creek that eventually runs towards the Zwickau Mulde. Just before flowing underneath the bridge, the creek merges with another one on the south side. Records indicated the structure’s existence between 1839 and 1840, but given the non-existence of concrete combined with how it was built, one must not rule out it being older- at least two centuries old to be exact. The bridge was put together using layers of flattened rock, which was topped with a keystone. Another layer of stone was added for the railway. The construction of the bridge mirrors those built during the Roman Empire, most of them were on a large scale, including aqueducts. Examples of these gigantic structures still exist today in Spain, France, Italy and parts of southern Germany- the nearest ones being in Heidelberg and Trier. The bridge is approximately 20 meters long and 3-4 meters wide, yet deterioration of the bridge due to erosion has taken a meter off its width over the years. The bridge is famous because of the stone used for it, known as Rosenstein. It’s a grayish-red rock which if in the water, it not only changes color to red, but the creation of creases in the rock caused by erosion and water creates a round form, resembling a rose. We fished out some examples that were lying in the Planitzbach, two of which I now have in possession and have demonstrated this magic to my wife and daughter. Several neighbors have used this stone for their landscaping purposed- including the gardens. The bridge has been closed to traffic for 30 years, with signs and bars blocking access. Despite this, people still cross at their own risk because they use the former Eisenstrasse as a hiking trail. Yet chances of restoring the bridge to its original form is slim due to years of erosion in the arches. The worst hit area is the eastern side, where waters have eaten away at the bridge. Should this progress in the next 10-20 years without any maintenance, the bridge may collapse. As mentioned earlier, northern side of the bridge at its keystone has seen the decking being eaten away due to erosion caused by wind and rain, plus weather extremities. And vegetation has taken over the bridge with a tree and many bushes growing near or on the bridge. Still it’s never too late to rebuild and reuse the bridge. The Rosenstein Bridge has a similar resemblance to another stone arch bridge located nearby, the Eger Bridge near Reichenbach in the Vogtland. Currently, funding has been approved for restoring the crossing which has existed since the 1769 but has been closed to traffic for over 30 years, bypassed by a concrete crossing. The arch bridge has suffered a lot since its closure, having sustained extensive damage due to floods and weather extremities. For the Rosenstein Bridge, one will need to rebuild the bridge from scratch, using the same materials as when it was originally constructed. Yet in order for it to be sturdy, some sort of adhesive would be needed, which could affect the bridge’s historical significance. Currently, the bridge is only known to locals and there has been no word of whether the structure would be a cultural monument, which means it could be updated into the Cultural Heritage Books (Denkmalschutzbuch) for the State of Saxony. Still, as one can see with the failed attempt to stop the demolition of the Bockau Arch Bridge (Rechenhausbrücke) near Aue (Saxony), just because a bridge is protected by the cultural heritage laws, does not mean that it cannot be torn down. That bridge was the very first structure in the state that was compromised by a replacement bridge through this concept, which puts many historic bridges and other structures on notice. Yet in order to start the process of getting the bridge listed and saving it from the wrecking ball, we need more information on it. This will require some research at the local archives in Zwickau but also some help from additional people who may know about this bridge and can add to what I’ve collected so far. This is where you as the reader come in. Afterwards the state ministry of culture and heritage in Dresden will have to step in and do a study to determine the bridge’s historic significance. 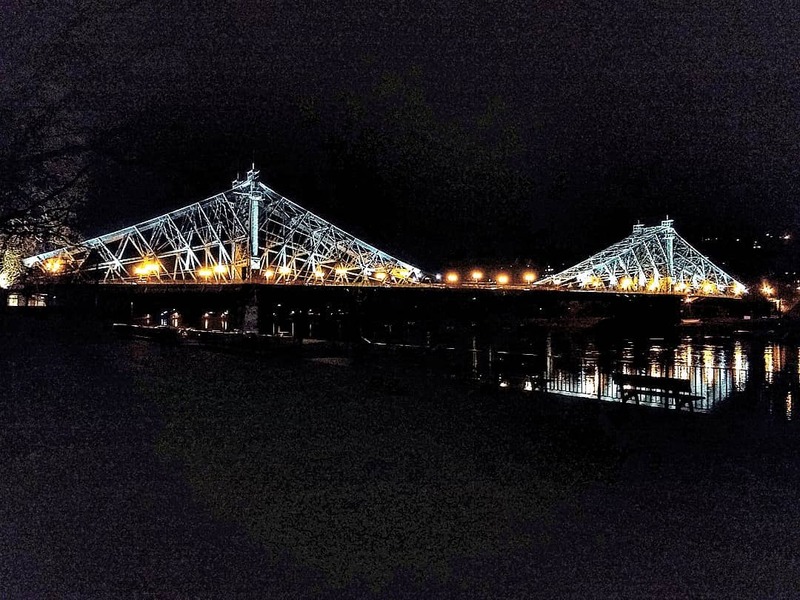 Once it’s listed, the bridge’s safe from demolition, and planning as well as fundraising can proceed to restore the structure, with proposals bouncing around on the local and state levels. While it’s easy to do it in chronological order, there has been some consideration about removing the bridge and possibly replacing it. That means everything has to be done at once to ensure we can beat the clock. This was a painful lesson we learned the hard way with the Bockau Arch Bridge- we started late and were always behind the clock, for the state ministry of transport was three goals ahead in handball and we had no chance to even tie the game- meaning in this case, delay the demolition to allow Berlin and Dresden to have a look at the petition. So what do we know about this find? If you are a local, tell us. What can you do to help save and restore the bridge? If you have the expertise and the will, tell us. What can you do to get the public’s attention? Apart from social media, the newspaper and meeting with people, if you have some ideas on where to start, tell us. Thanks to Dieter and his friend with the dog, we know where the bridge is in, and we have a starting point on its history. It’s just a question of moving forward. A link to the gallery of photos taken of the Rosenstein Brücke can be found here. Apart from Dieter Hofmann, there’s David Hagebäumer from the Free Press newspaper in Zwickau to thank for bringing this matter to my attention. Without the three of you and the dog, this bridge would’ve quietly vanished into history. Now we know about this gem, and knowing is half the battle. MOBILE, ALABAMA/ BUCKATUNNA, MISSISSIPPI- A historic bridge that was a local piece of history in a small town in Mississippi is no more. The Buckatunna Truss Bridge, located over Buckatunna Creek on Millry Road collapsed last week on the 16th of January after having sat abandoned for over a half century. The collapse was a result of high water undermining the lally columns, one pair of which was leaning against the trees along the shoreline. Furthermore, the bridge had been without a decking system and lower chord for many years. This is vital to ensure the truss structure is intact and together. No one was around when the collapse happened. The Buckatunna Truss Bridge was a three-panel, pin-connected Pratt through truss bridge with Howe lattice portal bracings, supported by subdivided heel supports. The overhead strut bracings were beam-shaped. According to history papers, the bridge was built in 1905, although it is unknown who built the structure, let alone if there had been a structure that existed before the truss bridge. Records indicated that the bridge was replaced on a different alignment in 1957 and had sat abandoned in the decades prior to its downfall. Passers-by had stopped to photograph the bridge because of its natural surroundings, which was left untouched, according to newspaper sources. 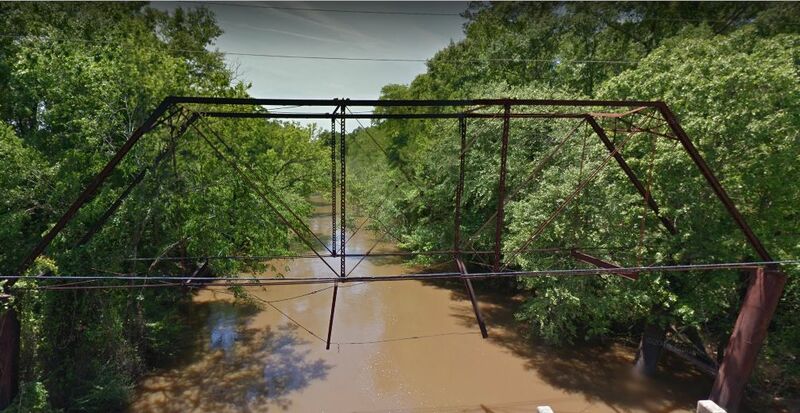 Plans are to remove the collapsed span once the floodwaters recede, however, to provide a proper closure, we need to know more about the bridge in terms of its date of construction and its life in a rural Mississippi setting. If you know more about it, leave a comment in the Chronciles page and tell us about the bridge’s story from your perspective. We’ll be happy to read more about it. A map is enclosed below to show its location. Most recently, one of the followers on my Twitter page posted a gif-pic of this bridge. This is located in China, spanning a very deep gorge. Obviously the bridge is a pontoon otherwise it would not be spanning a river that forms this gorgeous gorge. But the way the car crosses creates a wavy scenery that can be experienced from each vantage point, even from inside the car. Enjoy this short clip and if you want to help, tell us about the bridge and where in China it is located. Surely there will be more bridge enthusiasts who will pay homage to this unique structure while visiting other interesting places in China, from the Great Wall to Shanghai, Hong Kong to the Himalayans.